So the humidity in our basement got a little out of control. Yuck. Anyway, in addition to cleaning up the symptoms, I also need to attack the problem. A dehumidifier is about $200 plus taxes. Yikes! I wondered if I could do better. The basic premise of a dehumidifier is a compressor based cooling system that essentially squeezes the water out of the air. The air is drawn into the machine with a fan, blown out the back and some of the water from the air is captured and directed into a bucket below. The first section of a dehumidifier is a set of cooling coils. A liquid or compressed refrigerant expands rapidly inside these coils and absorbs heat in the process of boiling / evaporating. This cools the coils, which in turn cools the air flowing by. The cooler air cannot hold as much water, and so the water condenses on the coils. Eventually enough water condenses to form droplets that fall off into the bucket. The evaporated gaseous refrigerant flows through a compressor which forces it into a set of smaller coils at the back where it is squeezed back into a liquid. This process releases the heat picked up during evaporation. The air flowing past the cooling coils now flows past the hot coils (condenser coils) and regains the heat lost in the process (and some extra thrown in for fun). And the cycle repeats. Most window units have a drain hole or tube on the 'out' side of the unit to drain the water away - this one didn't, and with minutes the 'out' side fan was spraying water everywhere. This was quickly resolved with a 3/8" drill bit and a cordless drill. The unit was producing nearly 8 litres of water every 12 hours. 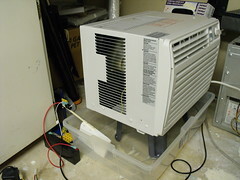 Removing the A/C unit, and carrying a large, wide container of water with no baffles to the floor drain was no easy task. I wanted an easier solution. So, with the money I was saving, I purchased a 12V bilge pump and 25' of tubing which I ran directly into the floor drain. 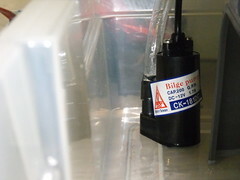 From spare parts I built a basic float switch to automatically turn the pump on when the container is about 1/2 full. As a bonus, the float switch runs the pump just long enough to prime the tubing (actually a bit longer) and then shuts off. Once full, the tubing effectively siphons the rest of the water out. In the end, I assembled one for about $120 that is nearly as functional with only feature lacking: A proper humidity sensor / control. A/C's are temperature based, dehumidifier's are humidity based. Not a big deal at the moment. I will probably run this in multi-day batches for a while and then buy a humidity fan control similar to those available for bathrooms. Oh, and once I get the humidity under control, the A/C unit can be properly installed and used to cool a single room down when the whole house doesn't need it. Hey folks! I've made the good - better! I added a dehumidistat and use it to maintain my RV battery. How cool is that!